This year, Dakota's chosen charity for giving back to the community during the holiday season was the Toys for Tots program. Dakota's team supported the cause by donating toys and gift cards for kids of all ages. Mr. Lokesh Sayal, Dakota Vice President said, "I'm pleased to witness the outpouring of generosity and kindness by Dakota team members. We hope our contribution helps in lighting up a child's face and bringing them holiday season joy." Dakota's Quality Manager, Reid Spearman, was named Rookie of the Year at the annual awards presentation of the Maryland Performance Excellence Foundation, Inc. Mr. Spearman, applied to be a quality Examiner for the Maryland Performance Excellence Award (MPEA) program. MPEA is managed by the Maryland Performance Excellence Foundation, Inc. and is the state's Baldrige-based education and recognition program. To earn this distinction, an Examiner must have had no previous experience with the Baldrige quality framework and must have made a significant contribution to his or her team. When asked for his reaction, he said, "I was privileged to be part of a great team. This recognition is more for them than for me. They helped me so much in my first year as an Examiner." Dakota's Meltem Turan was recently awarded National Institute of Standards and Technology (NIST) 2014 Information Technology Lab (ITL) Associate (non-employee) of the Year Award. 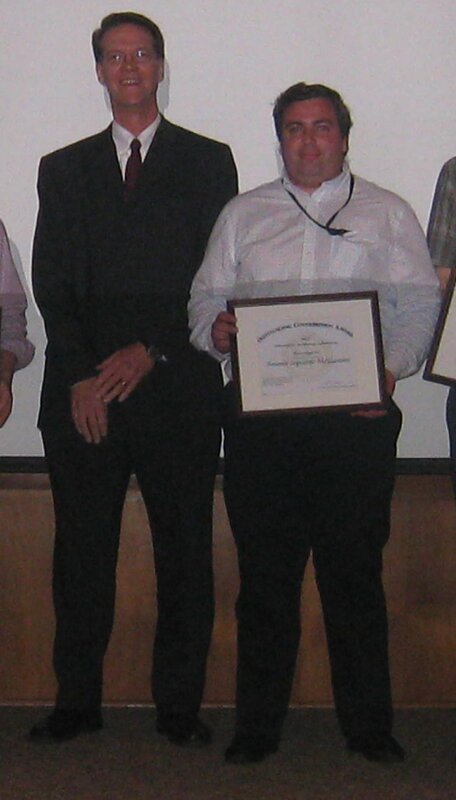 This award was presented for outstanding contributions to the standardization of cryptographic algorithms. Ms. Turan presented a poster, titled "Multiplicative Complexity of Boolean Functions" with Rene Peralta at the ITL's 3rd Annual Science Day on October 1, 2014. Ms. Lori Renner, Dakota CEO, noted, "We know Dakota has incredibly talented people. 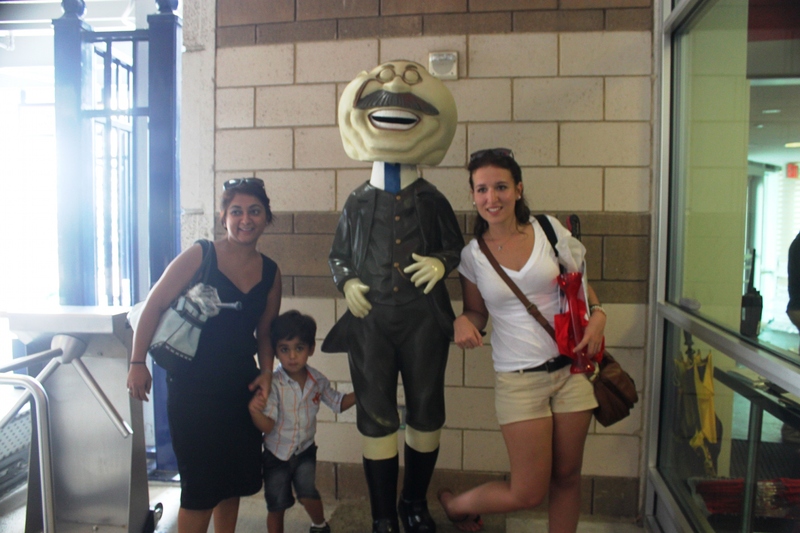 It is so gratifying to see their work recognized by our clients." Dr. Meltem Sonmez Turan - Poster: "Multiplicative Complexity of Boolean Functions"
Mr. Antoine Fillinger - Poster: "Smart America App Challenge: Data Logger & Playback"
Mr. Lukas Diduch - Poster: "Data Logger and Playback for an Integrated Clinical Environment"
Mr. Jing Gao - Live and interactive demonstration: "Interactive Measurements of Terabyte-Sized 3D Images"
Dr. Yooyoung Lee - Poster: "Generalizing Face Quality and Factor Measures to Video"
Dr. George Awad - Poster: "TRECVID - Learning context for video search"
Dakota won a contract with the U.S. Agency for International Development (USAID) to develop Computer-Based Training for Security Courses for the Office of Security (SEC). Mr. Lokesh Sayal, Dakota VP, commented about the award, "We are excited to initiate this project with USAID. USAID's mission to end extreme poverty and to promote resilient, democratic societies while advancing our security and prosperity resonates with the core values of Dakota." Dakota won two separate contracts to provide Program Management Office (PMO) and other IT support services to the Chief Management Office (CMO) of the Office of the Chief Information Officer (OCIO) at the Department of the Interior (DOI). Our services are in direct support of DOI's Cloud First initiative. DOI's Cloud First initiative resents new opportunities to modernize information technology delivery, reduce the burden of infrastructure expenditures and operations, and provide flexibility with on-demand commodity services. Dakota is proud to support this innovative initiative. 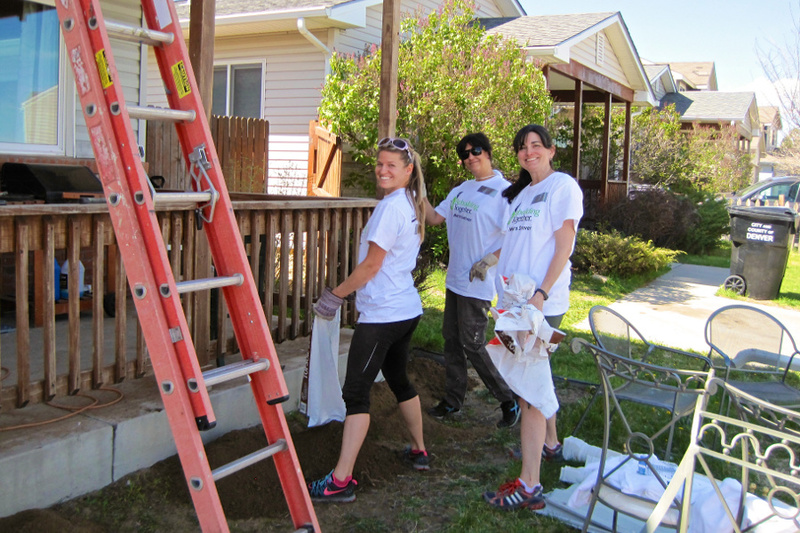 On Saturday, April 26, 2014, personnel from our Dakota West Division partnered with Rebuilding Together to restore the home of an individual in need in Denver, CO. 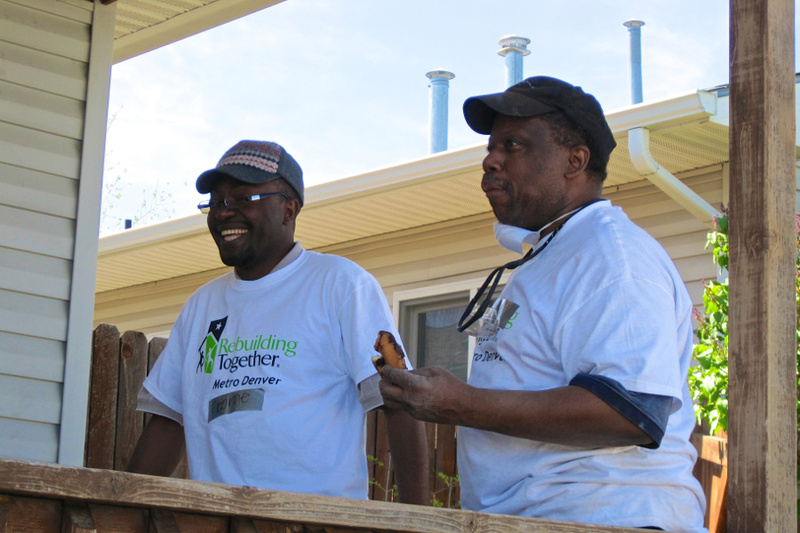 Rebuilding Together is a national network of non-profits that, for nearly 25 years, has provided critical repairs and renovations for low-income homeowners across the United States. 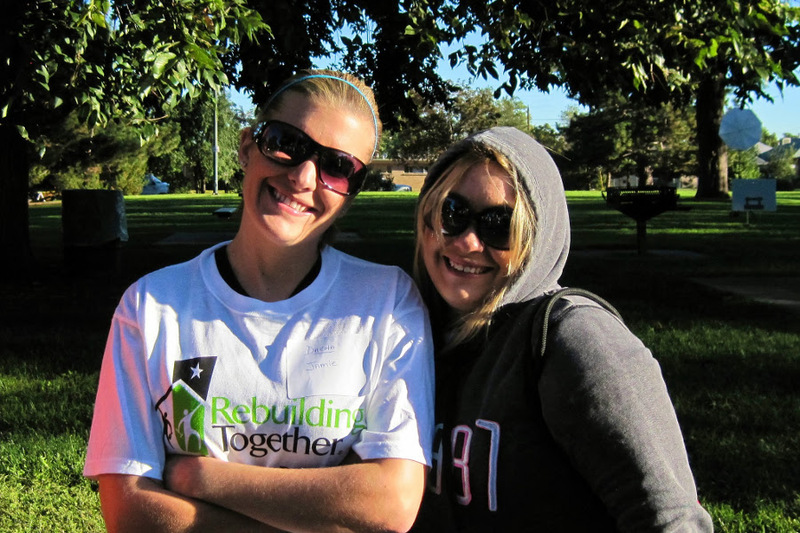 Dakota has supported Rebuilding Together in the Denver, CO area on an annual basis for the past several years. Dakota Consulting Inc. recently completed the Montgomery County Chamber of Commerce (MCCC) GovConNet Institute, receiving its Procurement Certification. Dakota's Vice President, Mr. Lokesh Sayal, represented Dakota to attain this certification. GovConNet Institute provides advanced training to Federal government contractors. The course is instructed by subject matter experts on best business practices in compliance, human resource management and capture strategies. The instruction is focused on winning and profitably maintaining Federal government contracts. Dakota was one of 15 businesses to graduate from the GovConNet Institute. The Institute covers topics like teaming agreements, joint ventures, risk management, financial reporting, regulatory requirements, and proposal writing strategies. Lori Renner, CEO of Dakota, remarked "The GovConNet program provides a valuable opportunity for Maryland-based businesses to network while learning from experts about best practices in a variety of topics—teaming agreements, joint ventures, risk management, financial reporting, regulatory requirements, and proposal writing strategies." "The GovConNet Institute is designed to help government contractors take their business to the next level," said Barbara Ashe, Executive Vice President, Montgomery County Chamber of Commerce. "The GovConNet Institute certification means that these 15 businesses are now better prepared to expand their business capabilities because they will have a foundation that will support accelerated growth." Dakota Consulting has been selected as one of the One Acquisition Solution for Integrated Services–Small Business (OASIS SB) multiple award contract (MAC) awardees by the General Services Administration (GSA). This MAC is available for use Government-Wide by any Federal Agency. OASIS SB could be valued at as much as $10B over its fifteen year contract life. Agencies that utilize the small business OASIS contracts to release task orders will receive credit toward their small business goals. Scientific Services: physics, mathematics, engineering, life, physiological, environmental, and social sciences, etc. Engineering: systems engineering, IV&V, quality assurance, system design, requirements analysis, data analytics, data management, system security and information assurance, software development, and software IV&V, etc. Program Management: PMO, acquisition support, project management, regulatory compliance, configuration management, risk management, technical data management, vulnerability assessments, and risk assessments and mitigation, etc. Management Consulting: business process reengineering, change management, strategic planning, concept development and requirements analysis, strategy development, and information analytics, etc. Logistics: deployment, inventory, security, supply chain, technology and industrial base, etc. Financial: budget analysis and tracking, affordability analysis, financial risk analysis, safeguarding personal data, and economic analysis, etc. Lori Renner, Dakota's founder and CEO, was thrilled by the announcement. "Dakota is honored that GSA selected us to continue to offer innovative, hybrid solutions for Federal Agencies. As an industry supporter of the OASIS concept, we applaud GSA's vision in the development of a contract vehicle designed to meet Agency complex problems, not a single discipline solution." During the 2013 holiday season, Dakota's Silver Spring office continued the tradition of adopting a family in need to make their holiday brighter. Dakota employees generously donated over $500 of gifts to the family of four. The mother joined us for a holiday luncheon on December 19th and was overjoyed with the gifts she was able to deliver to her family. On November 6, 2013, Wayne McFadden, a Quality Assurance Engineer at Dakota and a veteran of the U.S. Marine Corps, was an invited guest at the 2013 Veterans Day Salute sponsored by the U.S. Department of Labor. Mr. McFadden participated as part of a select group of veterans who have successfully transitioned into the workforce after the conclusion of their military careers. The event honored veterans for their service and urged employers to hire veterans and service members. 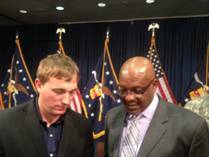 The event was attended by Thomas E. Perez, the U.S. Secretary of Labor, and Sergeant Dakota Meyer, recipient of the Medal of Honor, among many others. The event was held at the Great Hall of the U.S. Department of Labor. More information on the event can be found at http://www.dol.gov/opa/media/press/vets/VETS20132145.htm . The Dakota team spent the day working on a house that had not been maintained for many years. The years of neglect caused the exterior of the home to become susceptible to mold and rot. The team scraped lead based paint and primed and painted the outside of the home. The members worked on ladders most of the day stretching and sometimes contorting their bodies to scrape that last bit of paint off. Donning face masks, holding scrapers and paintbrushes and using a HEPA vacuum all while balancing on a ladder, our team prepped the house and cleared the way for additional work groups to continue the makeover. The Department of Labor's (DOL) Bureau of Labor Statistics (BLS) has awarded Dakota a contract to perform a FISMA Security Controls Assessment for its National Longitudinal Survey (NLS) System. NLS is physically maintained at BLS offices in Washington, DC, as well as the National Opinion Research Center (NORC) in Chicago, IL. As an OMB-designated statistical unit, the BLS system assessment will ensure compliance with the Confidential Information Protection and Statistical Efficiency Act (CIPSEA) of 2002 and the OMB Order Providing for the Confidentiality of Statistical Information. The Food and Drug Administration's (FDA) Office of Science and Engineering Laboratories (OSEL) has awarded Dakota a contract to provide LabView programming services. Dakota will provide software development services for the Functional Performance and Device Use Laboratory (FPDU), in support of studies on the impact of human performance factors and the design of a medical device on the successful use of a medical device. Dakota's synergized service offerings will allow us to operate at the intersection of engineering and software domains to develop an application that allows lab personnel to collect and store data from multiple sources. The National Mediation Board, an Independent Agency of the Federal Government, has selected Dakota to redesign its homepage: www.nmb.gov. Dakota will provide NMB with a low cost, easy to maintain, 508 compliant website that better captures the Agency's mission of "facilitating harmonious labor-management relations within two of the nation's key transportation sectors: the railroads and airlines." OPM has awarded Dakota a 5 year, $22.5 million BPA to provide IT Security Support to USA Learning's Learning Management Systems. Services provided under this agreement will include: security assessments, system evaluations, program management, POA&M management, IV&V, and A&A document preparation among other services. Dakota is pleased to announce it has been granted Third Party Assessment Organization (3PAO) status under the Federal Risk and Authorization Management Program (FedRAMP). Information on this program can be obtained by clicking here . As a FedRAMP Accredited 3PAO, Dakota is authorized to perform independent, third party security assessments for cloud service providers (CSPs). Dakota's FedRAMP Inspection Body supports the Federal Government and CSPs seeking a FedRAMP Authority to Operate (ATO). Dakota has been selected as a prime contractor to provide Risk Management Framework (RMF) services to the United States Department of Agriculture (USDA) Office of the Chief Information Officer (OCIO) under a Blank Purchase Agreement (BPA). The scope of this BPA includes RMF Steps 1-3b and 4-4b, Information Technology Security Assessment and Authorization (SA&A) of the over 700 USDA-wide Agency systems. Dakota Consulting, Inc. (Dakota) has been awarded a Blanket Purchase Agreement (BPA) to support the Peace Corps. Through this five (5) year, $5M multi-award contract, the Peace Corps will attain the Security Architecture/Engineering, Secure Coding, and Technical Writing services required to secure and maintain their technical infrastructure. Dakota is pleased to support an organization with such an honorable mission and outstanding tradition. Dakota's Peace Corps BPA activity support will occur within the Cybersecurity Business Services organization. The SmartCEO 100 Best-Run Companies honors companies selected for their successful operation and strong executive leadership. Members of this program have been identified as proactive, profitable companies in the Mid-Atlantic region. "The Best-Run Companies have the vision, talent, customers and internal processes in place to serve as strong examples to others in their markets and industries," says SmartCEO group publisher Jaime Nespor. "These companies have stood the test of time and have a proven track record of outperforming competitors. Their brand has created a strong reputation in the community they serve and we are very proud to recognize them and wish them continued success." Dakota expands its software and IT support for the Department of Homeland Security (DHS) through a recent contract award for the United States Secret Service. Dakota has been awarded a contract to provide IT support and assistance for the United States Secret Service implementation of DHS's Integrated Security Management System (ISMS). Dakota is pleased to announce that it will provide software development and security support services to another USDA agency, the Animal and Plant Health Inspection Service (APHIS). Dakota's Cybersecurity unit will provide security services for the National Animal Health Monitoring System (NAHMS) in Fort Collins, CO under a prime contract award. As part of a five year contract awarded to our partner, PhaseOne Consulting Group, Dakota will provide software development support services for APHIS's Plant Protection and Quarantine (PPQ) Integrated Data Services (PIDS). 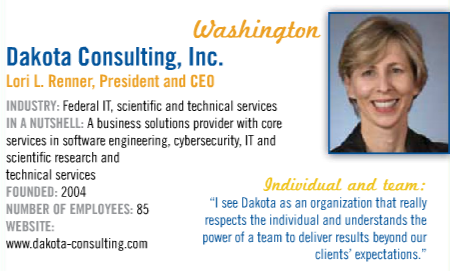 According to Dakota CEO and Owner, Lori Renner, "Dakota is proud to have supported NIST since 2004. We look forward to the opportunity to continue supporting the NIST mission." Dakota has been awarded an IDIQ contract to provide Information Technology and Database Application Support Services (ITDASS) by the National Institute of Standards and Technology (NIST). This competitive, multi-award, small business IDIQ will provide for the performance of computer science support services to the Information Technology Laboratory (ITL) and Materials Measurement Laboratory (MML) in areas including: Health IT, Biosciences Infrastructure, Cloud Computing, Voting, Computer Security, and Forensics. Specific projects may require the development of IT models, standard reference database implementations, IT test tools, archival database applications, and the archiving of electronic documents. Dakota's Cyber Security Services Area was awarded an order under our OPM BPA to provide the Office of Personnel Management (OPM)'s Federal Investigative Service Authorization and Accreditation (A&A) services. 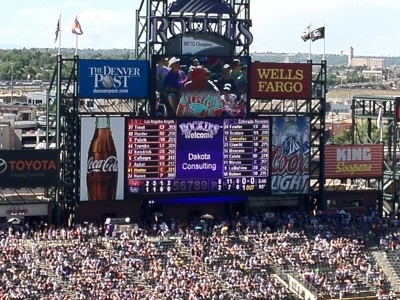 Dakota Denver enjoyed the day at the Colorado Rockies game and saw our name in lights! Dakota Consulting Inc., a leader in delivering high quality, creative, and innovative business solutions in Software Engineering, CyberSecurity, and Scientific Research & Technical Support Services received the ISO 9001:2008 Quality Management System (QMS) certification. This certification demonstrates on-going corporate commitment to continuous improvement and outstanding customer service. Dakota was awarded an order under our BPA to provide on-going operations and maintenance support services for the ENFORCE Apprehension Booking Module (EABM) and Web-Enabled Automated Biometric Identification System (WebIDENT) systems. This system is part of the portfolio managed by the OCIO's Systems Development Division (SDD) which has responsible for providing information technology support services in the development, implementation, and maintenance of agency software applications. 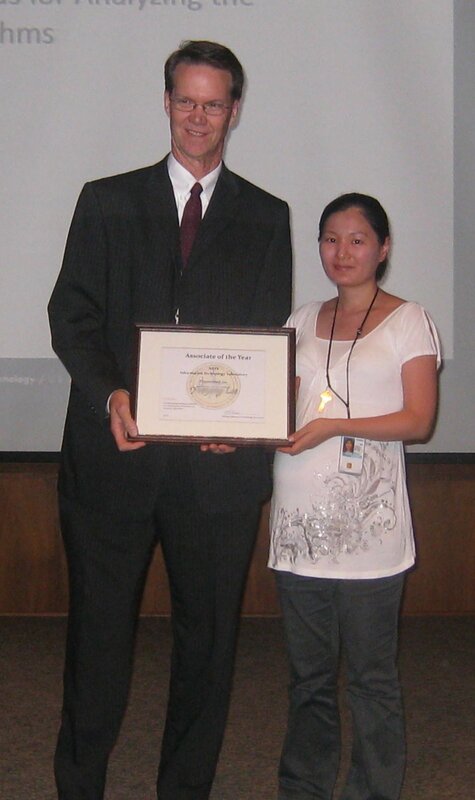 Ms. Lee received the Associate of the Year Award for developing statistical methods for analyzing the performance of biometric algorithms. Mr. Izquierdo and his team members at NIST won the Outstanding Support Award for significant contributions to the national effort to design and plan a high speed nationwide network for public safely agencies. Dakota was awarded a contract to conduct an independent IV&V evaluation for the Department of the Interior (DOI)'s proposed Network Optimization and Conceptual Infrastructure. Dakota was awarded a contract to provide software engineering support NIST's Information Technology Laboratory's (ITL) Software and Systems Division (SSD) in Health IT. Dakota has been awarded a contract to provide Security Assessment and Authorization support services at the NIST campuses in Gaithersburg and Boulder. Dakota has been awarded tasks by OPM to provide financial and administrative support services including invoice processing, project coordination, and project reconciliation. Dakota Consulting, Inc. was awarded as a prime contractor an Information Technology Services Blanket Purchase Agreement (BPA) by the Office of Personnel Management (OPM) Office of the Chief Information Officer (OCIO). Through this IT Services BPA, Dakota will provide services in multiple security special technical areas (STAs), including: Certification and Accreditation (C&A) and POA&M management. In addition to Dakota's award as a prime BPA holder, we are a subcontractor to IBM, another BPA award winner in STA areas covering application systems and database development and maintenance, network and server operations and maintenance, security services, project management, and engineering. 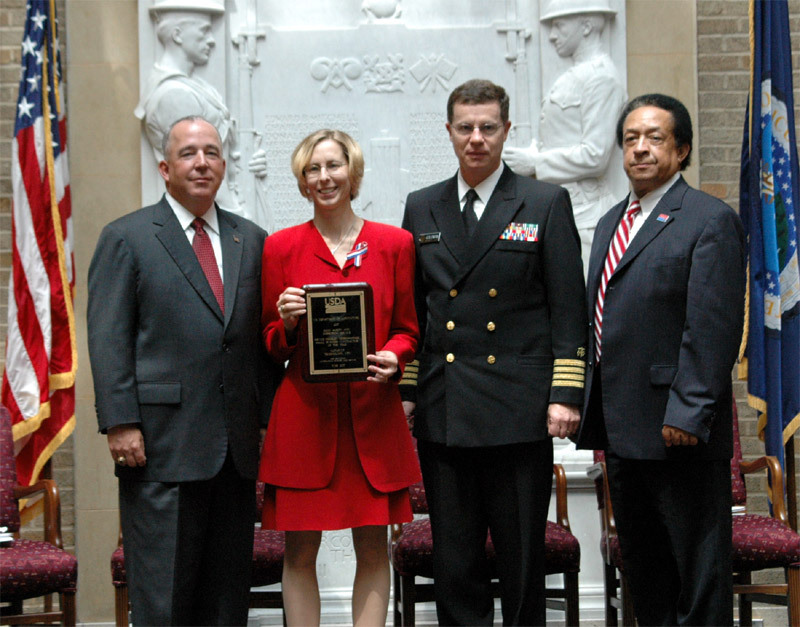 These joint wins allow Dakota to provide a complete range of IT services to OPM. In the 13th issue of Washington Smart100 Magazine, Smart CEO selected 100 CEOs for their knowledge, strategies, and success in the Greater Washington region. Smart CEO is a highly respected group for hardworking individuals that are looking for a positive influence from local CEOs. These 100 CEOs are chosen for their leadership, strategic vision, and character. Lori Renner was recognized as a 2011 Smart100 CEO for her creative solutions, outstanding customer service, and influential leadership. As a Smart 100 award winner, Dakota Consulting, will be able to inspire others by sharing lessons, experiences, thoughts, and ideas through this unique program. Dakota was awarded a blanket purchase agreement (BPA) to provide software operations and maintenance (O&M) support services for the Office of Chief Information Office (OCIO) within the U.S. Immigration and Customs Enforcement (ICE) Agency in the Department of Homeland Security (DHS). Under this contract vehicle, all Federal Agencies can contract with Dakota to meet their Information Technology (IT) services and business solutions needs. STARS II is a competitive multiple award, indefinite delivery, indefinite quantity contract vehicle. STARS II is designed to promote small business utilization when purchasing IT solutions for the Federal Government. Orders over $4 million are competed amongst contract holding industry partners in the chosen area. For further information, please contact GSASTARS@Dakota-Consulting.com or 240.839.7812. Dakota was awarded a contract to provide Scientific, Technical, and Engineering Support Services to the National Institute of Standards and Technology (NIST). Through this contract, Dakota will directly support all NIST laboratories: the Physical Measurement Laboratory (PML), Material Measurement Laboratory (MML), Engineering Laboratory (EL), Information Technology Laboratory (ITL), Center for Nanoscale Science and Technology (CNST), and the NIST Center for Neutron Research (NCNR). Support may also be provided to NIST cooperative programs such as the Hollings Manufacturing Extension Partnership (MEP), Baldridge Performance Excellence Program, and the Technology Innovation Program (TIP) as well as joint institutes operated by NIST. 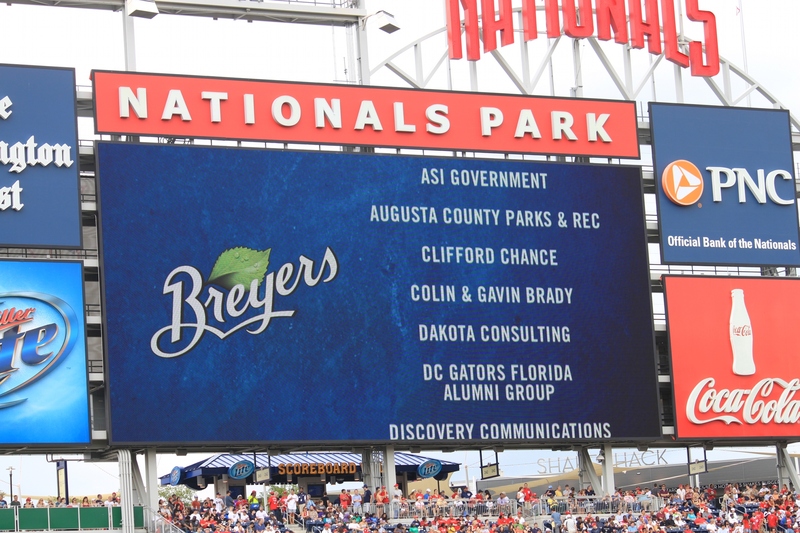 Dakota wins a contract for providing operations/event planning management support services for the Maryland Administrative Office of the Courts. On September 13, 2010, Dakota won a contract with the Small Business Administration (SBA) to provide software development services in support of the Investment Division's Extranet Web-based System. On May 24, 2010, Dakota won a contract with the Department of Labor (DOL) to perform Certification and Accreditation (C&A) services for the Occupational Safety and Health Administration (OSHA). 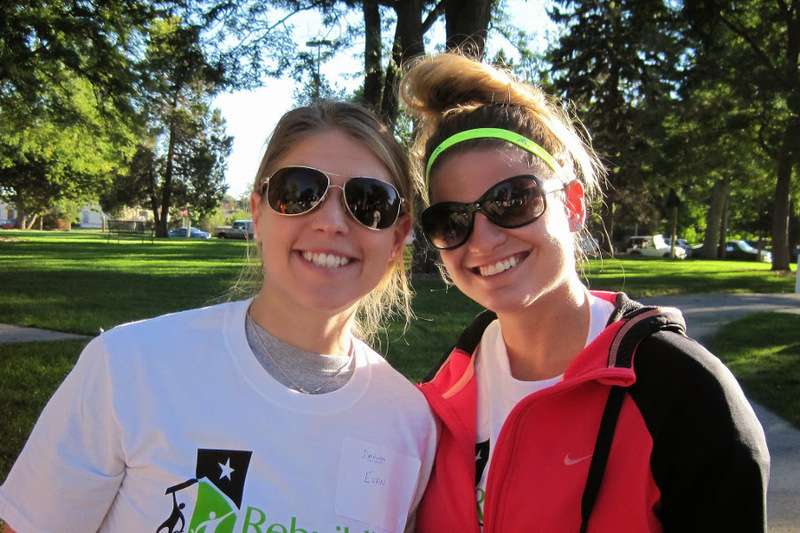 On April 24th, 2010, Dakota partnered with Rebuilding Together for the 2nd year in our Annual Corporate Volunteer Event. Colleagues and friends of Dakota completed a variety of home improvements on homes in Silver Spring, MD and Denver, CO. This is an opportunity for our team to do something great for those in need, and as you can see from the pictures, we had a great time as well! On April 23, 2010, Dakota won a contract with the Office of Personnel Management (OPM) to perform Certification and Accreditation (C&A) services for the USAJOBS Recruit program. On October 9, 2009, Dakota Consulting was awarded its Washington Metropolitan Area Transit Authority certification. On January 12, 2010 the company obtained an additional certification from the Maryland Department of Transportation (MD DOT). Dakota is excited about the opportunity to provide high quality IT services to WMATA and MD DOT. The NAIS-Web Team was honored with the NIST Bronze Medal award for developing and implementing the web-based NIST Associate Information System (NAIS). Dakota staff supported the NAIS-Web effort by providing on-site project management, database, software development, testing, and training support services as part of the integrated team effort. From NIST Director, Patrick Gallagher's e-mail to NIST staff: "The Bronze Medal Award is the highest honor presented by NIST. The award, initiated in 1966, recognizes work that has resulted in more effective and efficient management systems as well as the demonstration of unusual initiative or creative methods and procedures. It also is given for significant contributions affecting major programs, scientific accomplishment within the Institute, and superior performance of assigned tasks for at least five consecutive years." William A. Kamitakahara received the NIST Colleagues' Choice Award for his efforts on the NCNR (NIST Center for Neutron Research) Proposal System. The NCNR Proposal System, was described as the backbone of NCNR scientific operations and broadly hailed by the user community as among the world's best. Dakota staff supported the full life cycle software engineering effort for the NCNR system, including requirements validation, design, technical architecture, development, testing, training, and operations and maintenance. In September 2009, Dakota won a new project with Manufacturing Extension Partnership (MEP) at the National Institute of Technology (NIST) in Gaithersburg, Maryland. Dakota's team is working with MEP to implement a robust web based portal using Microsoft Technologies. The portal will support MEP's internal staff, as well as Center staff located across United States. The portal will provide extensive reporting capability and will allow users to collaborate across various communities of practices. The FAA awarded Dakota Consulting Inc. a BPA for the eFAST program. The eFAST program is the FAA's preferred acquisition vehicle for fulfilling Agency Small Business goals. Dakota is qualified to provide services under the followinge FAST functional areas: Business Administration and Management (BAM); Computer/Information Systems Development (CSD); and Computer Systems Support(CSS). Dakota won a contract with Region 8 EPA for implementation support services of their Service Desk. We're excited to be working with EPA to provide outstanding service to the Region 8 customer base. Dakota Consulting's Antoine Fillinger, a member of the NIST Smart Space Project, published an article entitled "Middleware and Metrology for the Pervasive Future" in the July-September 2009 issue of IEEE Pervasive Computing Mobile and Ubiquitous Systems. The article presents the NIST Data Flow System II middleware for distributed sensor data acquisition and processing. It also describes an effort to advance pervasive computing technology by a community of industrial and academic researchers working to integrate pervasive components into complex multimodal systems using this middleware. The article can be found at here . Dakota Consulting's Antoine Fillinger wins the Best Demo Award at the 2008 IEEE World of Wireless and Multimedia conference in Newport Beach, CA. Antoine's Best Demo Award was for his outstanding demonstration and work on the NIST Data Flow System II (NDFS-II). NDFS-II is a middleware for sensor data acquisition, transport and distributed processing. It offers network transparent services to build multimodal applications. An application is represented as a data flow graph, with streaming data flowing between the different computational components allocated on a local network of systems. It was originally developed to support research on pervasive environments such as smart spaces but it also facilitates the development of complex multimedia applications with very high bandwidth requirements and the simulation of large complex systems. GSA has made an award to Dakota Consulting, Inc. under Schedule 70, Multiple Award Schedule (MAS) program. Government officials can order our services through the GSA Advantage! website. 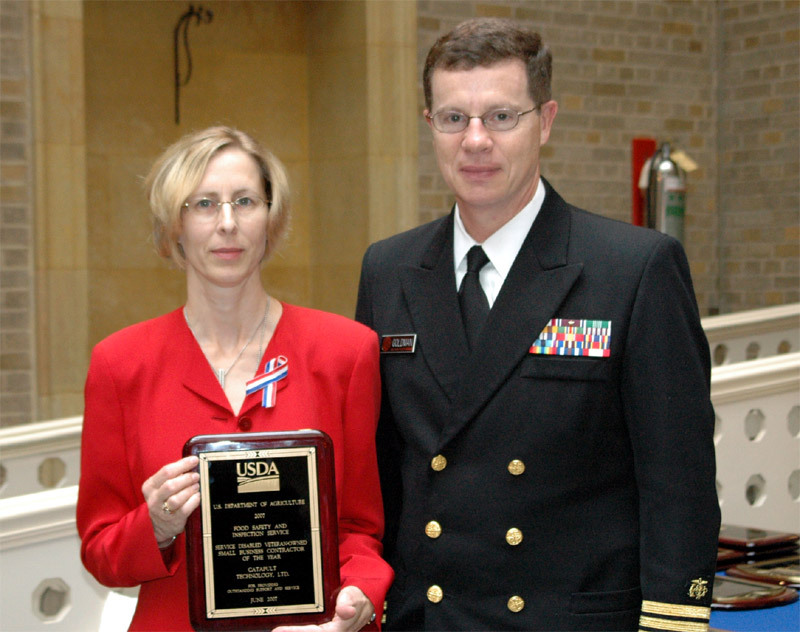 Ms. Lorraine Renner, President of Dakota Consulting, accepted the USDA Agency Service Disabled Veteran-Owned Small Business Award on behalf of teaming partner Catapult Technology. The nominating agency for the award was the Food Safety and Inspection Service. The USDA annually conducts the small business and AbilityOne award program to recognize the outstanding work achieved by members of the USDA community; including small, small disadvantaged, women-owned, HUBZone, service disabled veteran-owned and AbilityOne businesses.